One of the many roles of women in the Civil War was that of a soldier. Due to the fact that women were not allowed to serve in the military at the time, these women disguised themselves as men, cut off their hair and adopted male aliases in order to join the military. How Many Women Fought in the Civil War? According to the American Battlefield Trust, between 400 to 750 women fought as soldiers in the Civil War. The authors of the book They Fought Like Demons: Women Soldiers in the American Civil War give a different number though, stating that they found a total of 250 documented cases of women serving as soldiers in the war but they suspected there were many more than that. It is hard to pinpoint the exact number of women who fought in the war due to the secrecy of what they were doing. The only reason we know of these women at all is because their real identities were discovered and documented at some point. Some of these women were discovered while in service either because they were wounded, captured or died and, as a result, they were physically examined by doctors. The discovery of their true identity usually resulted in some kind of paperwork, either through discharge papers, letters between military officials, death certificates and etc, which would have left a paper trail of documented evidence. Other women confessed to their actions, either through letters to friends and families, or by writing memoirs about their experiences and even by applying for Civil War pensions which required them to provide proof of service and reveal their aliases. Other times, their military service was made public for the first time when they passed away, years after the war, and their military service was revealed in their obituary. For the women who were never discovered, and historians suspect there were many, their stories remain lost forever. Women soldiers fought in some of the biggest and most famous Civil War battles. 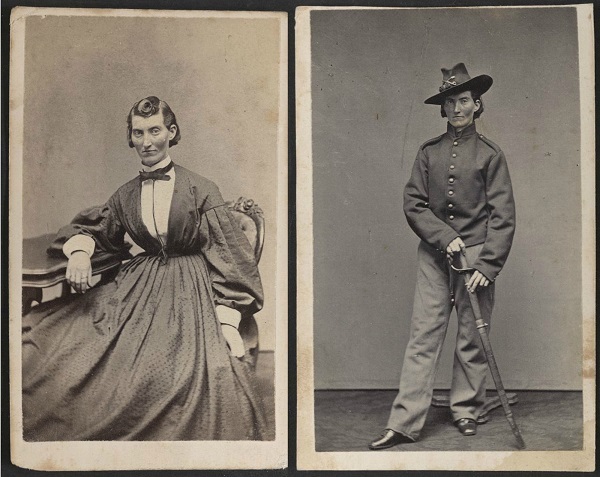 It was often when these women soldiers were wounded that their real identities were discovered. Wounded women soldiers were discovered at the Battle of Shiloh, Battle of Richmond, Battle of Perryville, Battle of Murfreesboro, Battle of Antietam, Battle of Fredericksburg, Battle of Gettysburg, Battle of Green River, Battle of Lookout Mountain, Battle of Peachtree Creek, Battle of Allatoona, the Battle of the Wilderness and etc. In addition, dead women soldiers were also discovered at the First Battle of Manassas, Second Battle of Mannassas, Battle of Shiloh, Battle of Gettysburg, Battle of Resaca, Battle of Dallas, Battle of the Crater, Battle of Petersburg and the Battle of Appomattox. 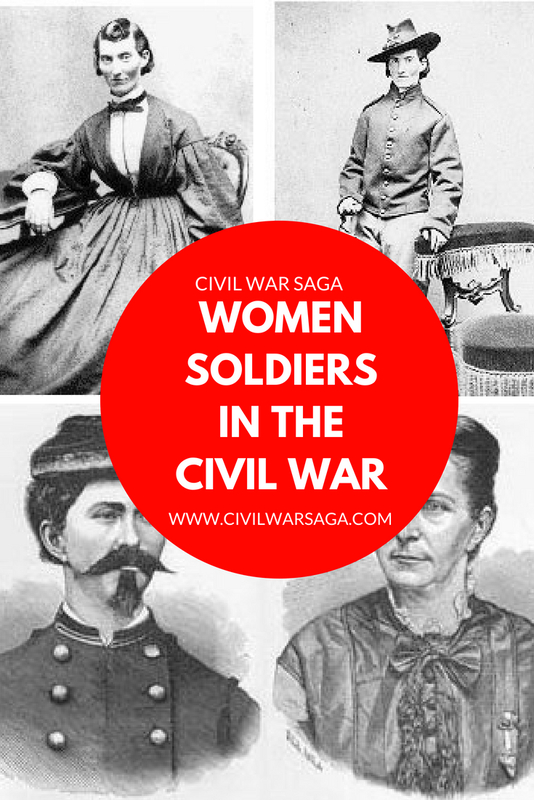 The actions of these women soldiers have been forgotten over time but the public was well aware of the women soldiers at the time of the Civil War because their stories were routinely reported in newspapers across the country. Why Did Women Fight in the Civil War? Since there isn’t a lot of documentation on why most of these women joined the army, it is assumed that they joined for the same reasons men did. These reasons include money, patriotism, adventure and a chance to travel. These women soldiers tended to be young, unmarried, childless and poor which meant they didn’t have a lot of obligations at home to keep them from going to war. A few women soldiers actually published memoirs, wrote letters during their time in service or gave interviews with reporters and explained their personal reasons why they decided to fight in the war. Romantic notions about following in the footsteps of Joan of Arc were quite common among these young women. In 1864, the Brooklyn Daily Times published an article about a young Brooklyn woman named Emily who fought and died at the Battle of Lookout Mountain. The names of the the following women soldiers come from multiple sources such as as old newspaper articles as well as the book They Fought Like Demons which uncovered them in various documents such as military records, published diaries, letters and memoirs. In some cases, only the women’s male alias is known and in other cases only the women’s first name is known. 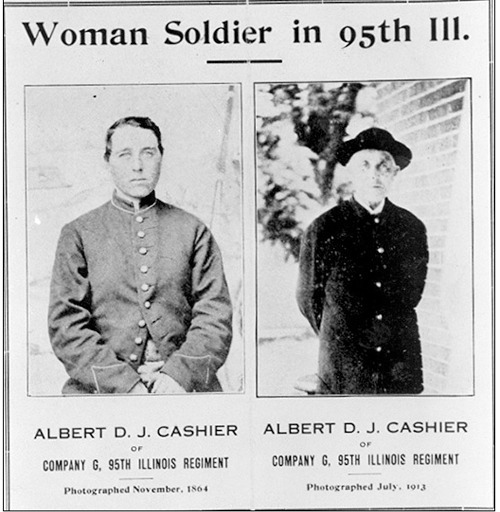 Unfortunately, in many cases, when women soldiers were discovered the press reports or military documents about them intentionally excluded their names to protect their identities. • Sarah Bradbury, alias Frank Morton, 7th Illinois Cavalry, 2nd Kentucky Cavalry, her real identity was discovered after she got drunk with another female soldier, Frances Hook, and they both fell into a river for which they received medical attention. They were both sent home but Hook joined another regiment and continued fighting. • Sarah Williams, alias John Williams, 2nd Kentucky Cavalry, her real identity was discovered after three years in service and she was arrested and sent to the Post prison in 1864. In addition to serving as soldiers, women also worked as spies, war relief workers and nurses during the Civil War. The best estimate of female combatants in the Civil War has been provided in John A. Braden, “Mothers of Invention: Phony Reports of Female Civil War Combatants.” in the January/February, 2015 Camp Chase Gazette (Vol. XLII, NO. 1). Extrapolating from reports of captured female combatants, he estimates the total at 131. He also demonstrates that higher estimates are based on speculation and/or unreliable accounts. 1st Sergeant Mary Jane Wright served with Co. F, 4th Kentucky Cavalry. She enlisted or was recruited while Col. Henry L. Giltner’s 4th Kentucky Cavalry kept its headquarters in Wytheville, Virginia, during the spring of 1864. In December 1864 the 4th Kentucky Cavalry was camped at Wytheville when word arrived that Union General Stoneman, commanding a division of cavalry, was advancing from Tennessee with their objective being the salt mines at Saltville, Virginia. In an effort to stop them, the 4th Kentucky along with the 2nd Kentucky Cavalry met Union General Stoneman’s forces at Kingsport, Tennessee. The resulting battle was a defeat for the Confederate forces and resulted in the capture of scores of the Confederates on December 21. Among those captured was Company F’s 24-year old 1st Sergeant Mary Jane Wright. Along with her comrades, she was taken to Knoxville, transferred to Louisville on April 7, 1865, and finally transferred to Camp Chase, Ohio, Union prison. She was in prison for almost five months. Upon taking the oath to the United States, she was released on May 11, 1865, and returned to Wythe County, Virginia. Note that her service record verifies the above. Please include her in your accounts. You mention a Mary Wright captured near Knoxville. She is probably the same person. Where could I locate published memoirs of woman who fought in the American Civil War?